Star Wars: The Force Awakens comes to life as a beautiful piece of artwork by artist Brian Rood! 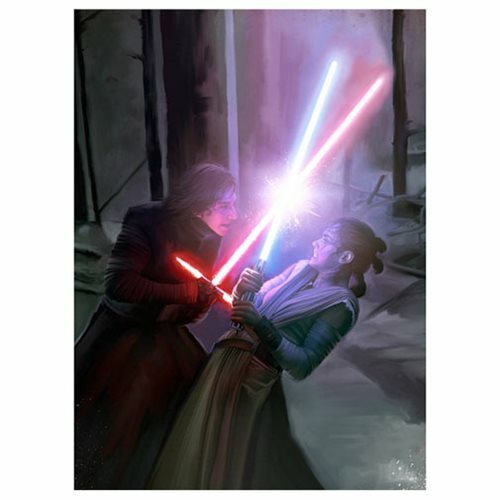 Featuring the beautiful and photo-realistic style of Brian Rood, this amazingly detailed piece of art depicts the tense lightsaber duel scene between Rey and Kylo Ren from Star Wars: The Force Awakens. This stunning artwork is a limited edition of 95 pieces hand-numbered on canvas, signed by the artist. Measuring 30-inches tall x 20-inches wide, it even comes with a certificate of authenticity!